Born in Derby in 1976, Mark Preston is the younger member of an already well known artistic family. He studied illustration at Anglia University in Cambridge, but it was sketching and painting trips with his father, Rex Preston, to the Peak District, Cornwall and Scotland that really inspired him to become a landscape painter. 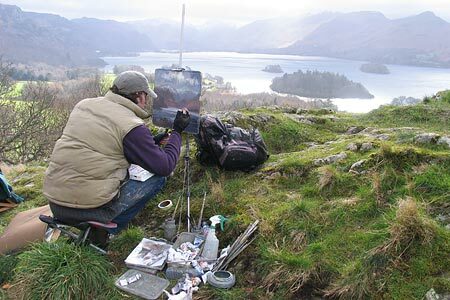 Mark paints in acrylics and works mainly in situ with relatively little time spent in the studio. “For me, experiencing the landscape and elements directly is essential to attempt to capture them in paint. I just need to be there to respond to the situation and the spirit of the landscape” This direct approach of working from nature, allows him time to observe and experience the subtle changes in colour, light and atmosphere, enabling him to build up an understanding and awareness of the places he paints. One mainstay of Mark’s thinking comes from John Constable’s declaration that “Nature is the fountain’s head, the source from whence all originality must spring”. Derbyshire, the Lake District and Penwith in Cornwall are the main areas he paints and it’s the way the changing seasons and weather affect these places that fascinates him. Mark has been having one-man shows in Derbyshire and Cornwall from the age of 21 and has had exceptional success in recent years, his work has been published as greeting cards by Paperhouse and Canns Down Press. It takes only a glance at Mark Preston’s work to realise to he is a born artist. Of the canvasses from his latest exhibition at Bakewell's Ridgeway Gallery, just look at River Wye, Chee Dale where Mark has combined a compositional eye, careful application of paint and considered brushstrokes which have elevated a literal landscape to one of emotion, expression and empathy. His masterly depiction of light and atmosphere has transformed a mere tranquil idyll into something paradisiacal and dreamlike without ever prettifying the scene. There is also to be seen in these works the outpourings of an artist at one with nature, a connection clearly glimpsed in Grasses, Trevelgan Hill, where you almost feel those grasses waving in the breeze. There is a similar aliveness in Breaking Wave, St Ives, as if magically the paint had been applied in the same fleeting moment it took for the swell to break on to the rock. Ironically, you'll find the grown-up Mark painting almost exclusively in situ rather than in studio. His penchant for painting en plein air was influenced by sketching trips with his father and fellow artist Wilfred Ball who, in turn, influenced the budding Mark with their teachings and 'great enthusiasms'. Mark will also never forget the enthusiasm and inspiration offered to him by his art teacher at Bemrose School, Miss Langhorne. A project she created in class was a creative turning point for Mark: 'We had to choose an artist, copy several of their paintings and then do our own subject using their style', Mark recalls. 'I chose Van Gogh, and analysing his work really sparked off my interest in colour. As Van Gogh himself said: "I don't care whether my colour is the same, as long as it looks as beautiful on my canvas as it does in nature". I really got involved in trying to see the subject through his eyes. This early insight into this great artist has always stayed with me'. Indeed, Mark is never far away from a notebook brimming with quotes from artists like Van Gogh who have informed Mark's approach. One mainstay of Mark's thinking comes from John Constable's declaration that 'nature is the fountain's head, the source from whence all originality must spring'. There is a Constable feel in Mark's romantic rendering of Evening Sunlight, River Trent, while in another watery canvas Reflected Gold, Dovedale, some of Van Gogh's love of bold colour combines with the atmosphere of Turner, another acknowledged influence. For his striking seascapes, Mark cites the influence of Joan Eardley: 'For me, her paintings are a perfect balance', states Mark, 'whereby you see an abstract application of paint which still retains a sense of the subject, something I strive to capture as well'. Another turning point for Mark was the time, just before the final year of his art degree course in Cambridge, when he accompanied his father to Cornwall. For the first time, he painted on location. Furthermore, on the strength of those Cornwall paintings, the late Michael Mosley of the Granby Gallery in Bakewell gave him his first exhibition - and first sale. In fact, every painting was sold. This was enough to give this 21 year-old degree scholar the confidence to paint for a living. Mark went on to have annual exhibitions at the Granby Gallery for seven successive years until it closed in 2005. 'His style and palette come together with such exciting results' is one of Mark's treasured quotes from Michael Mosley. The 'freshness and emotion' that came from Mark's palette encouraged the Tregoning Gallery in Derby to also grant him an exhibition. 'Just look at his seascapes', enthused Phil Tregoning; 'he throws the paints on as if they were waves. Although close up it's abstract work, stand back and you can feel the rush of those waves or, in other pictures, the wind rustling the vegetation or the sun shining down'. Sarah Ridgeway, who is hosting his latest exhibition, has similar feelings about Mark's ability to evoke such strong response from the viewer. 'When I look at Mark's paintings', Sarah declares, 'I get a sense of standing just at the edge of the scene itself, witnessing the effect of the weather on the landscape, just as Mark felt as he was painting it. I can almost hear the waves crashing over rocks and feel the breeze rustling through the grasses on the headland. I have never visited the areas portrayed yet, looking at the paintings, it feels like they are triggering a memory. I want to reach down into the cotton grass as I gaze over to the distant moors. I want to continue to walk along the river. This tells you why I am so thrilled to host Mark's 2008 exhibition'. 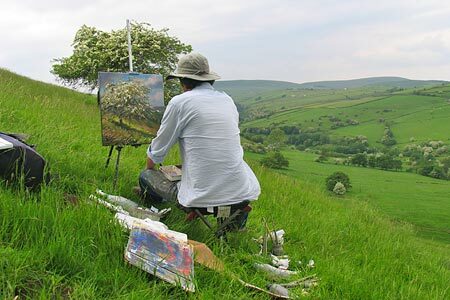 Some viewers have literally stood at the edge of scenes where Mark himself has painted, and observed him painting in situ. You can often find him in the Peak, especially in the Ashleyhay area of Alport Height and in particular in spring when the rolling landscape is covered in gorse and bluebells. 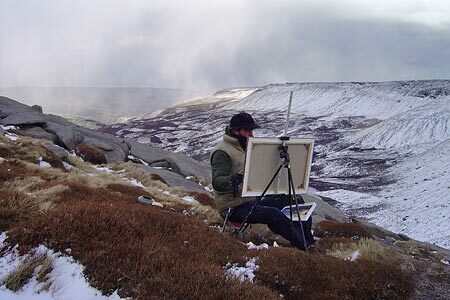 For Mark, experiencing the landscape and weather directly is essential when it comes to capturing them in paint. 'I feel I need to be there to experience all the elements directly, to respond to the situation and the spirit of the landscape', Mark asserts. 'I try to go out with no preconceived formula or style in mind, allowing myself only to be influenced by the day. The beauty of this method is that no two days are ever the same and it's the way the landscape constantly changes with the weather and the seasons that fascinates me. So many people who see me out painting have asked "wouldn't it be easier to work from a photo?" My answer is always "no". I think it's much better to rely on your own powers of perception. That way, you train your eye to really see and understand the subject first hand. You can give yourself time to observe and absorb the subtle changes in light, colour and atmosphere. The artist Douglas Hill told me once that "Nature is the teacher". I think the more you study nature, the more you learn. Even the failed paintings teach you something'. Mark also feels blessed by the variety and subtlety of Derbyshire. 'There's so many great subjects to paint and they are all concentrated into a relatively small area', Mark observes. As he craves the sea, Mark's other favourite haunt is the Penwith area of Cornwall, especially the stretch of rugged, dramatic coastline between St Ives and Lands End. 'Some of the heather moorland, rocks and wild open spaces almost make Penwith feel like Derbyshire with sea', comments Mark; 'I love to paint the Cornish light and those wild seas'. He discovered that wildness once when the tail end of Hurricane Gordon blew his easel and palette into the crashing waves. 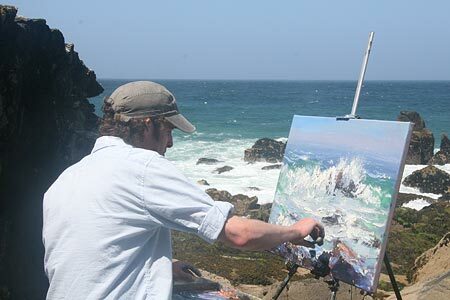 In painting al fresco, Mark has been both frozen and baked, buffeted by gales and soaked by rain and sea spray, but he wouldn't have it any other way. 'I tell you, it can really focus the mind if the tide is on the way in to get me, the light is fading or a storm approaching', Mark points out. 'When I know I have only got another ten minutes left on the painting before nature intervenes, the painting can speed up and the emotions I feel at the time can go directly into the work'. Never mind the emotions, the elements themselves can go directly in to the work, quite literally: 'There have been occasions when I have had to abandon paintings that have got covered in a layer of snow or frozen solid’, explains Mark; ‘but sometimes rain has actually helped paintings by mixing in with the paint and creating a mysterious, more abstract effect'. However, communing with nature has one notable downside: 'I really can't stand midges', admits Mark. 'Last August on Froggatt Edge, it felt like I was being eaten alive and I was forced to down the brushes and dash for the car'. And what of his first admirer, his father Rex Preston? 'To be a good painter you have to be obsessed so that it becomes something you have to do', affirms Rex. 'The more you paint, the more you see and the more you find to paint. I recognised this quality in Mark from an early stage. He is reaching a very high standard now and with his motivation and dedication to painting, he can only get better. I look forward to each of his exhibitions with pride'.